The celebration started with the Holi puja. The Holi fire was lit by Acharya Gaurang Nanavaty. HOUSTON: The Holi celebration at Chinmaya Mission Houston on Sunday, March 24th, gave joy to adults and was immense fun to children. Over 700 members participated with amazing zeal, making it a truly memorable day. Rain or shine, the event was to go on as planned. Volunteers were seen working enthusiatically in the courtyard of the Saumyakasi Sivalaya temple since that morning. The volunteers of the food team started to cook the festive lunch early in the day. The courtyard was decorated with beautiful strings of colorful pennants. The holi fire was set in the middle of the courtyard. The sound system amped up the joyous mood. Piles of vibrant colors were set up to be distributed to all participants. 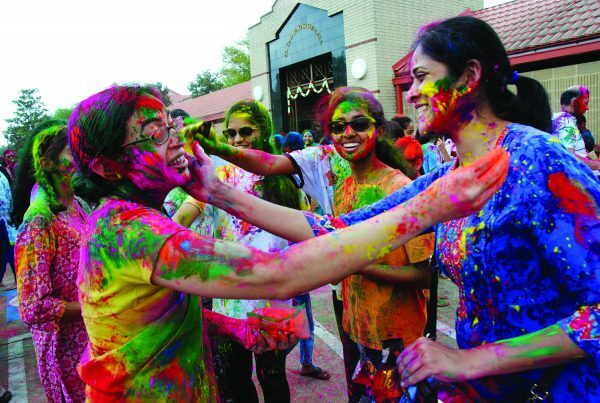 As if to reward all devotees, the Gods too seemed to shower their love gifting all with a beautiful day – the perfect weather for all to sing, dance, and play with colors to their hearts’ desire! At 1.00 PM, all participants gathered in the courtyard. The celebration started with the Holi puja. 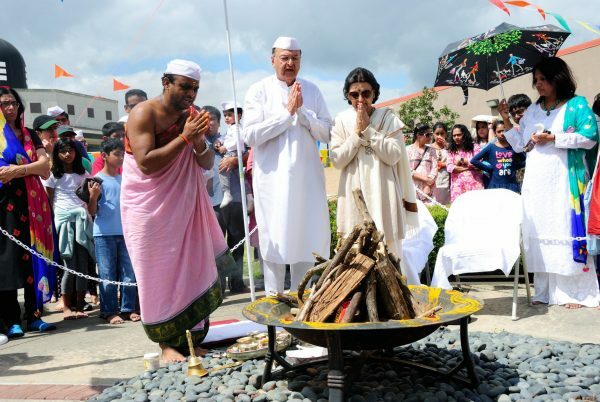 The Holi fire was lit by Acharya Gaurang Nanavaty. Worship was then followed with food. The blue skies and soft spring-green lawns called for picnicking on freshly made traditional delights – tasty chole-bhature, sweet jalebi, and crispy bhel. A flash mob dance set to rocking songs got the whole crowd moving. This set the mood for the “Gokul” games, specially crafted to convert the whole temple courtyard into Gokul-Vrindavan, the childhood home of Lord Krishna. Children found the “Gokul” or “Go-Cool”- namely the “naughty little Krishna” games – absolutely enjoyable and funny. It was an experience also that revolved around bonding with their mothers. “Bruj ki Lathmaar,”again a tradition during Holi, where the better halves got a chance to ‘beat’ their spouses with laathis or clubs (kindly redesigned with soft, spongy pool noodles) was surely delightful. “Going to River Yamuna” and “Balance the Water Pots,” walking with water (balloons) in a container on their heads followed. Every child and adult alike wanted to participate in these games. The day ended with a splash, of course! Colors filled the air as they got thrown and smeared in this happy celebration of the advent of spring. Photos by Rajesh Thatte. The day ended with a splash, of course! Colors filled the air as they got thrown and smeared in this happy celebration of the advent of spring. With beaming smiles on colored faces, and with warmed hearts, all families drove back to their homes looking forward to next year when they can do this all over again!